It’s been about 2 weeks since I’ve posted anything at all. Thanks for the concern, but no… I didn’t get kidnapped or go into witness protection. I went to Hawaii. I work for a TV show, and my bosses actually paid me real money to help shoot on location for a few days. It was gorgeous. It was warm. It was scenic. I’d like to say I got a chance to enjoy the beach, but I’m pretty sure I came back with less of a tan than I had when I arrived. That’s because this is where I spent most of my time. A tiny conference room with no windows. 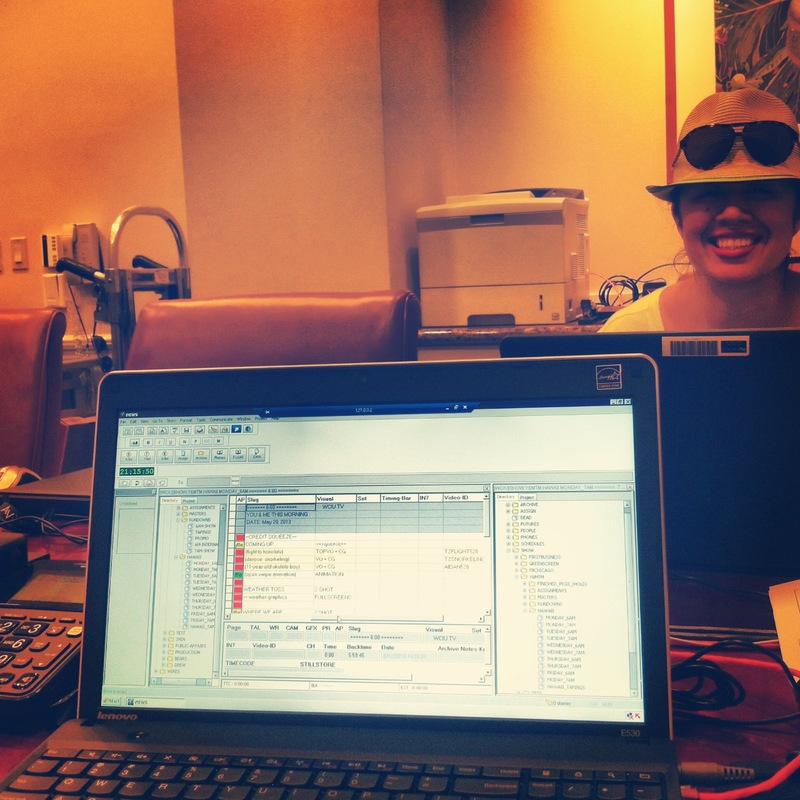 Say hi to my coworker Melissa! 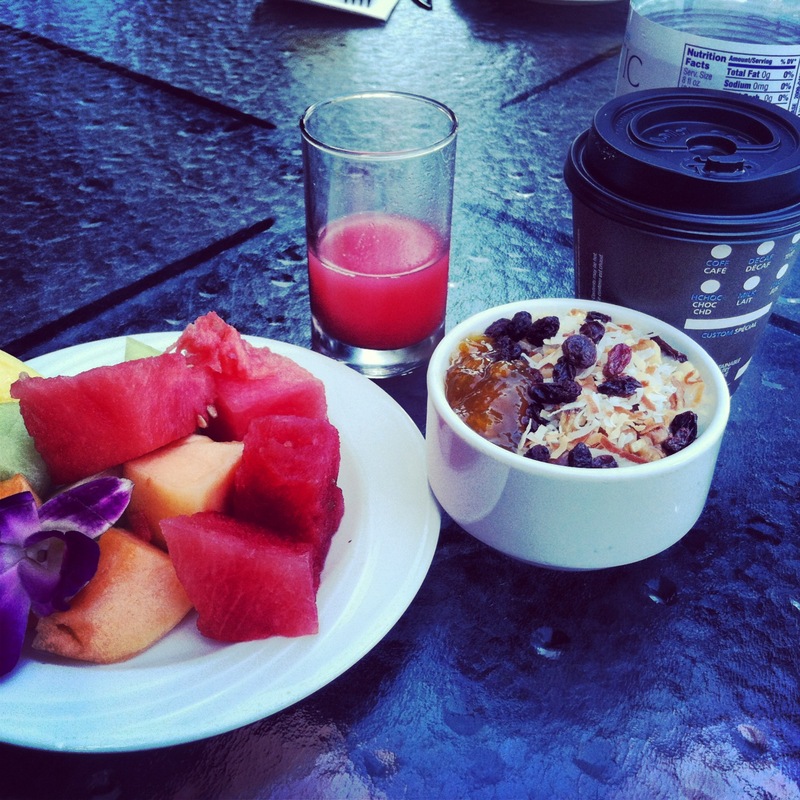 My daily continental breakfast courtesy the Hilton Hawaiian Village: Fresh fruit, a little guava juice, some of the awesomest coffee I’ve ever had at a hotel, and oatmeal with toasted coconut, raisins, walnuts, and tropical marmalade! THIS MONSTROSITY! Take a minute. Soak it in. This is a lobster dog. Sausage made from lobster. Real lobster. I regret to say I choked half of one down during a short break in taping. I didn’t get a chance to really savor it, but I’ve been dreaming about it ever since. In case you were wondering, it came from Hank’s Haute Dogs in Waikiki. The owner, Henry Adaniya, left Chicago and an illustrious culinary career to start a hot dog joint in Hawaii where his parents were born. We featured him on the show. He might be one of the most laid back, interesting people I’ve ever met. 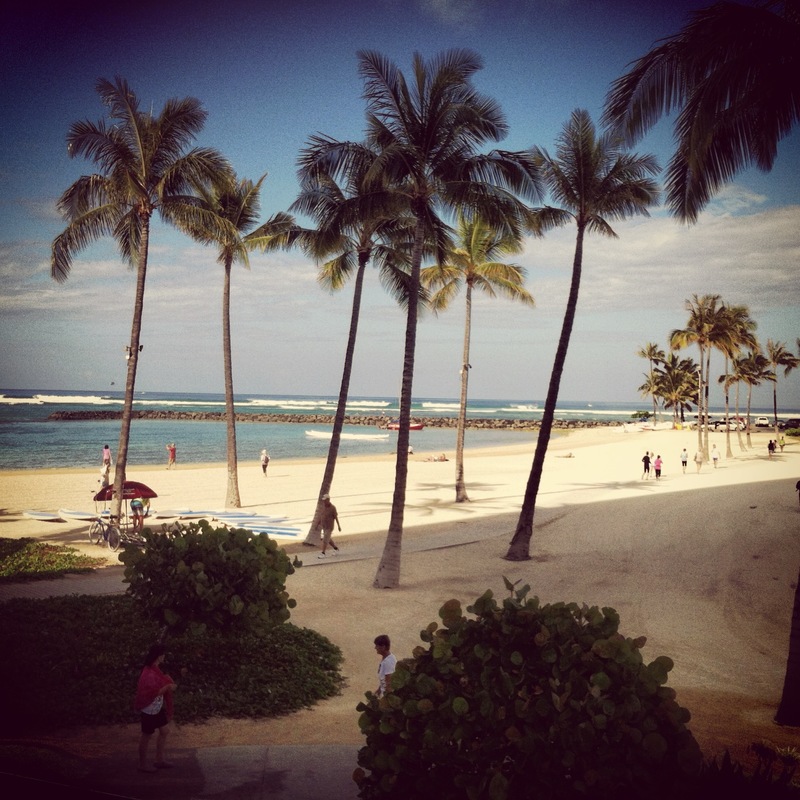 GO TO OAHU. GO TO HIM. ORDER A LOBSTER DOG. One night, I actually had time to eat a real dinner, so my afore-mentioned coworker Melissa and I spent as much of the company’s money as we possibly could on cocktails, raw oysters, and sushi. 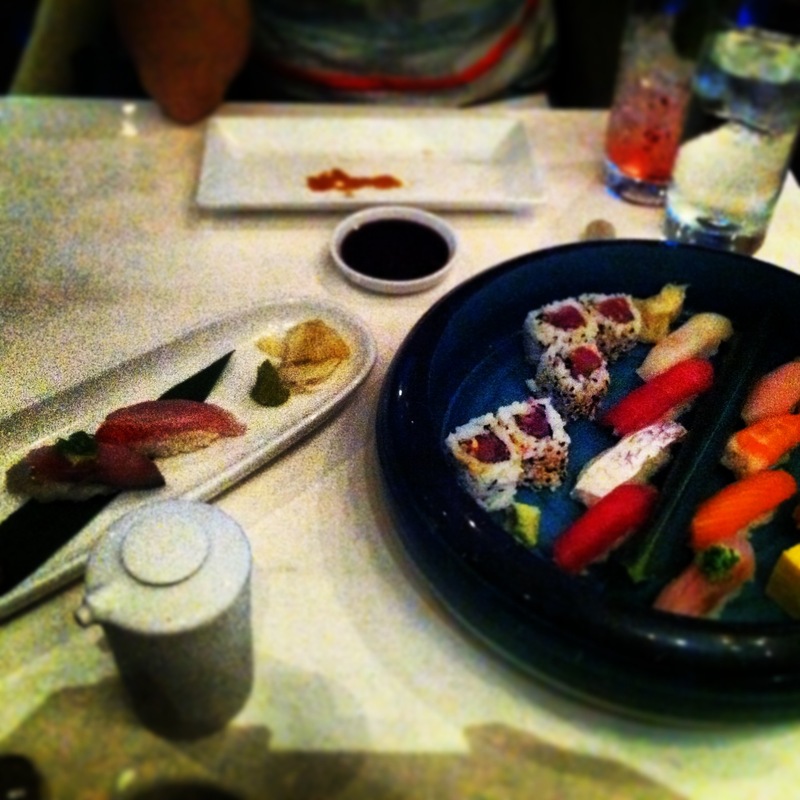 We didn’t realize until after we were back at the hotel that we were at Morimoto’s place. The guy from Iron Chef? Yeah. Had no idea. But I did pay $14 for one piece of sashimi! Great success! And finally, a tasty souvenir for my buddy Dexter. 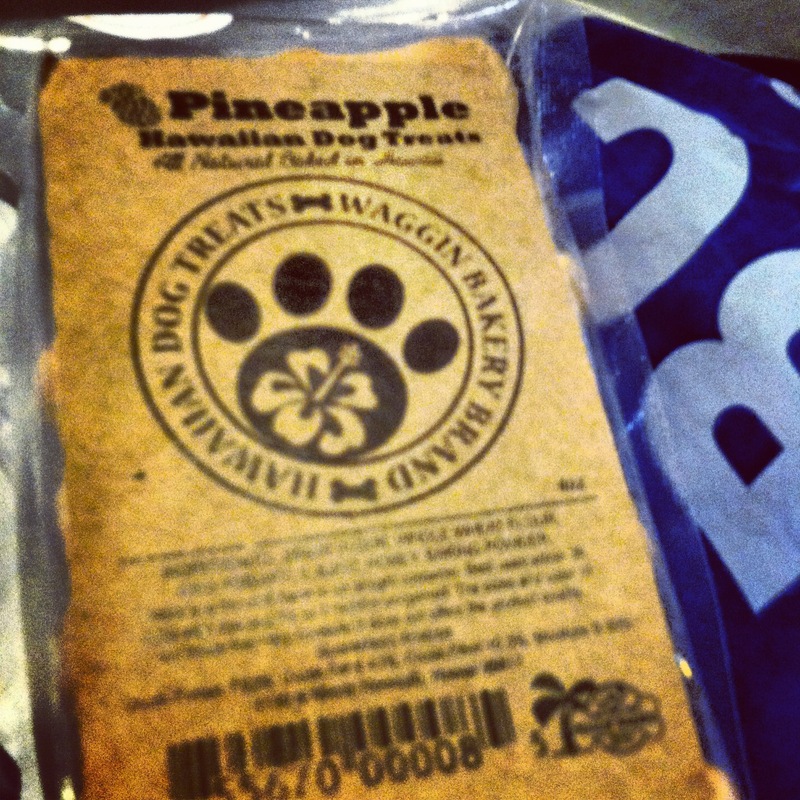 Pineapple doggie biscuits! Oh, and remember how I was doing the whole Bob Harper Jumpstart to Skinny thing before the trip? I ended up losing a total of 6.2 pounds… and I gained back almost 4.5 of them in just two weeks while I was on the road. WHOOPISE! Not sorry. I’d never take back those ribs. Or that lobster dog. Besides, it’s probably just water weight, right? 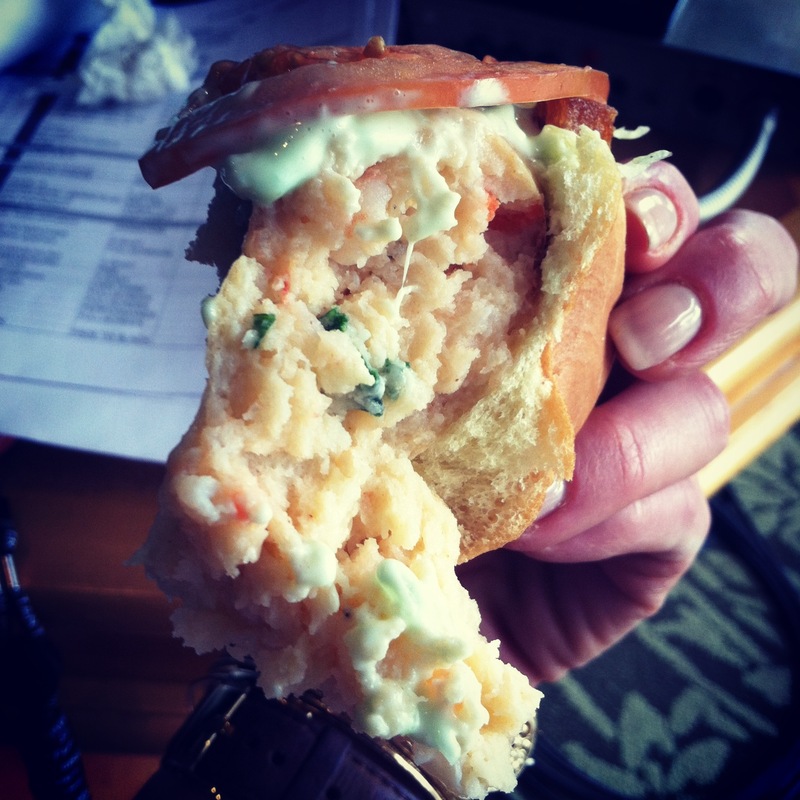 Posted in Uncategorized and tagged bob harper, food, hank's haute dogs, hawaii, hawaiian, hot dog, jumpstart to skinny, lobster dog, morimoto, oahu, pineapple, sushi, trip, vacation, waikiki, weight loss, work trip. Bookmark the permalink. Update! I’ve survived 2 whole weeks on Bob Harper’s Jumpstart To Skinny plan! I outlined the basics about a week ago HERE. It’s a 3 week diet aimed at getting you to a better body fast before a big event, or to “jumpstart” a longer weight loss journey. My big event happens to be a work trip to Hawaii (I’m serious). 800 calories a day for women. 12oo for men. It’s temporary, yes… but that kinda of starvation takes some getting used to. I’ve remained mostly on track, minus a premeditated trip to my favorite sushi buffet last Saturday. I don’t even feel guilty. There was mackerel. The Jumpstart To Skinny plan never really tells you how much weight you should expect to lose, which I actually appreciate. Everyone’s different. Heavier people will lose more. Fitter people will lose less. That’s just how our bodies work. In 2 weeks, I’m down almost 5 pounds, and I’m totally thrilled. I feel lighter, my clothes fit better, and I could be hallucinating… but I think I see an ab or two trying to come up for air. I will say that I’m not following the diet exactly the way Bob outlines it in the book. I’m not taking fish oil. I’m not, for the most part, working out in the morning. I’m not drinking espresso first thing out of bed. I have, however, stopped pretending like coffee with sugar-free creamer and stevia isn’t important to me. It just is. Yes, the creamer is artificial. No, it’s not accounted for in the daily calorie limit. I don’t care. It makes me happy. Just like that sushi buffet did. The plan has gotten a lot easier as the days press on, mostly because I’ve been repeating recipes that I like and finding ways to make them actually taste good. In my last post about Jumpstart To Skinny, you’ll remember that I mentioned that Bob’s recipes are bland. 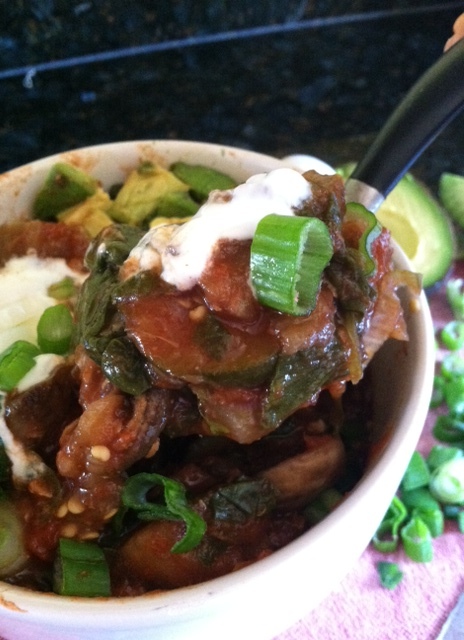 Total understatement, so I decided to get creative with his Eggplant Chili dinner recipe. First, I’ll post Bob’s version. Then, I’ll post mine. 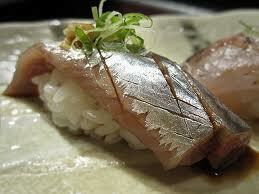 It’s 100 times tastier, and the changes do not compromise the rules of the diet. Heat the olive oil in a medium pot over medium-high heat. Add the garlic and the eggplant and cook for 5 minutes. Add the turkey and cook for about 7 minutes, stirring occasionally to break up the meat, until browned. Add the tomatoes and broth and simmer for 20 minutes. 279 calories, 24g protein, 23g carbs, 7g fat, 7 grams fiber. Okay, time for my version! Before we move on, it’s important to note that all the meals in the Jumpstart to Skinny book adhere to a strict 40/40/20 rule. That’s 40% protein, 40% carbohydrates, and 20% fat. I’ve taken some things away, but added other nutritionally similar ingredients I think are a better use of the calories (i.e. they taste better). I’ve also replaced the turkey with canned tuna. I know. Sounds gross. But that’s only because I’m a sometimes fish eater and not a meat eater. Tuna, I decided, was a better idea than tofu. It tastes better than it sounds, I promise. Oh, and one more thing. All of the veggies in this recipe are UNLIMITED, so go crazy! I added as many as humanly possible while still keeping a chili-like consistency. This version makes four pretty large 3 cup servings, so you can make a big pot and eat it all week. Add garlic, eggplant, and a little bit of the veggie broth to a large pot, stirring frequently over medium heat. Cook until tender. Add the zucchinis and mushrooms. Again, cook until tender. Add the rest of the veggie broth, the entire can of crushed tomatoes, the spices and the tuna/choice of lean protein. Stir and simmer until heated. Divide batch into 4 servings, about three cups each. 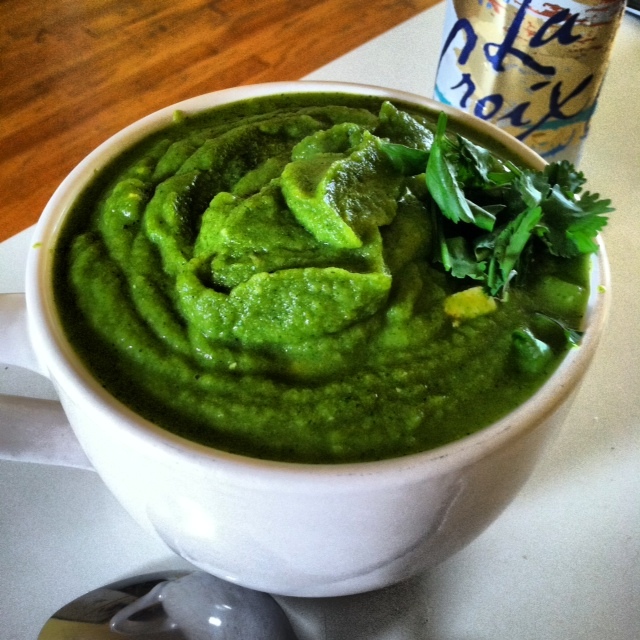 Garnish each with exactly 1/4 of an avocado, a dollop or greek yogurt, and as much green onion as you want. Because we’re not using olive oil, we can have the avocado. Because the protein is spread out over more servings, we can add a little extra with the greek yogurt. Tomatoes are on the list of unlimited veggies, and the crushed variety adds to the heartiness of the meal. The spices, in my opinion, are an obvious addition. This is a low-calorie dinner I actually look forward to… and it keeps me full! Do you have any healthy tricks up your sleeve to make bland foods taste better? Let me know! Comment in the section below or e-mail me at thehungrytortoise@gmail.com. 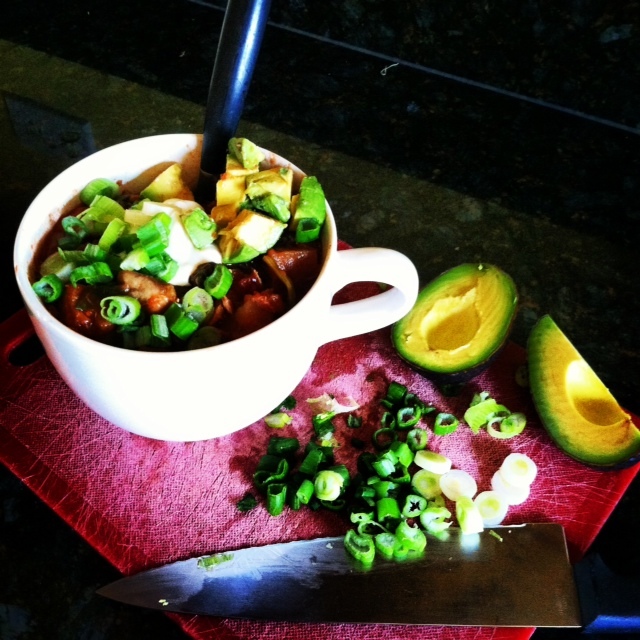 Posted in Educational Resources, Recipes and tagged 3 weeks, avocado, better, biggest loser, bob harper, chili, diet, diet plan, eggplant chili, greek yogurt, healthy, jumpstart to skinny, low calories, low fat, low sodium, pescetarian, recipe, vegetables, weight loss. Bookmark the permalink. I have a confession to make. I’m on what probably qualifies as a crash diet. Usually, this is totally NOT what I do. I’ve done things like this before with disastrous results, but desperate times call for desperate measures. My other job… you know the one that actually pays me money… just decided to send 13 of us to Hawaii! It’s not a vacation. We will be working really long hours. It’s only about 4 days. But guys… it’s HAWAII. It’s PAID FOR. I WILL find my way to a beach if it kills me. And we’re leaving in 3 weeks! Eeks! 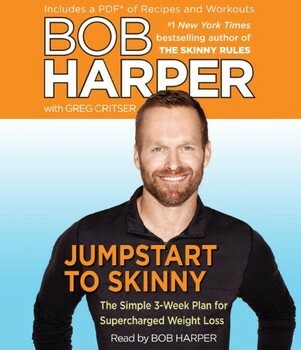 Just as I’m freaking out about being in a bathing suit in front of all my co-workers, celeb trainer Bob Harper from “The Biggest Loser” comes out with a new diet book. It’s called “Jumpstart To Skinny“, and what a coincidence! It takes exactly 3 weeks to complete. Have I been saved?! “Jumpstart” has gotten some bad buzz, because it only allows 800 calories a day for women, and 1200 a day for men. Extreme? Definitely. Torture? Kinda. But will it hurt you to only eat 800 calories a day for 3 weeks? Probably not. Especially because Bob has you eating lots of really nutritious stuff. The idea is to get you to a better body fast before a big event, or to “jumpstart” a longer weight loss journey. Shopping lists and daily recipes are included. He does all the work for you. Proper 40/40/20 proportions. 40% protein, 40% carbs, 20% fat. Today, I’m at the end of week one… day 7. The first 2 days were brutal. I was starving. My stomach actually woke me up in the middle of the night a few times, because it was growling so loud. But it’s getting easier. I’m keeping a diary of my thoughts day by day to share with you later. I “accidentally” had some red wine on Saturday, but here’s the headline – I’ve already lost a significant amount of weight, anywhere from 3 to almost 5 pounds, depending on the day. Losing weight has never been easy for me, so this is big news. But then again, I am only eating 800 calories a day. Speaking of eating, I wanted to share with you what I had for dinner last night. You’ll find it in the book. Because I’m a vegetarian, I swapped the chicken for tofu. If you’re into tofu, the substitution works well enough. This isn’t something I would necessarily choose to eat again. It wasn’t great, but it wasn’t vomit-worthy. The only good part is that the portion is huge. I counted 3 whole cups. And yes, it looks like baby food. Combine cauliflower, broth, dill, and spinach in a medium saucepan and bring to a simmer. Add black pepper if desired and simmer for 5 minutes. Let cool slightly, then pour into a blender and puree until smooth. Pour back into the pot, add the chicken/tofu and bell pepper, and simmer for 10 minutes. *NOTE ONE: To roast cauliflower, boil large florets in a pot until al dente. Spray with olive oil spray, and roast in 450 degree oven until the tops start to brown. *NOTE TWO: I actually added a lot more broth, because my “soup” turned out way too thick. Bob would likely not approve because of the extra sodium, but you do what you’ve gotta do. NOTE THREE: I also added some diced onion and minced garlic to the pot before anything else. That’s just how I get down. NOTE FOUR: The thing about Bob’s recipes is that there’s like, zero salt. And I love salt, so I’m struggling with that. But he’s right. It leads to bloat and water retention, and ain’t nobody got time for that, especially when they (ME) are trying to look good on the beach in a couple short weeks. I’ve been trying to add more spices like chili powder and cumin to add flavor. I accidentally put cinnamon on my egg whites yesterday morning (yes, I ate them anyway). But I say, raid the spice cabinet and get creative! Have you ever done a crash diet? Did you gain the weight back? If not, how did you keep it off? I can almost guarantee I’ll pack the pounds back on as soon as I get off the plane, so I need back up! Get at me in the comments section below, or e-mail me at thehungrytortoise@gmail.com. Posted in Educational Resources, Recipes and tagged biggest loser, bob harper, crash diet, diet, fit, fitness, green cauliflower soup, healthy, jumpstart to skinny, low calorie, low fat, low sodium, new book, quick weight loss, recipe, supercharged weight loss. Bookmark the permalink.